Jelly beans aren’t necessarily new candies—they're made from a combination of pre-Biblical and 17th century candy techniques. But the Jelly Belly rebranded the sugary treat to something much sweeter, and much higher-end, than your typical flavored gummy. 1. 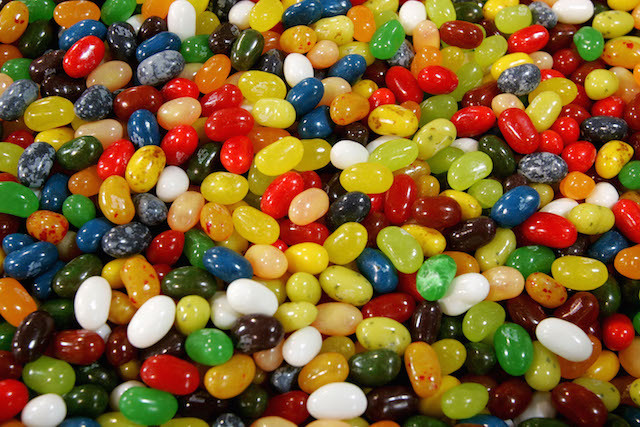 JELLY BELLY'S FOUNDER IS FAMOUS FOR ANOTHER POPULAR CANDY. Jelly Belly jelly beans are a 20th century sweet, but they are tied to a much older candy company: the Goelitz Candy Company. Confectioner Gustav Goelitz began creating and selling candies in 1869, just a couple of years after moving to the U.S. from Germany. By 1894, Goelitz had passed the company on to his sons, and they soon released Chicken Feed buttercream candies—the popular treat we now call candy corn. But, it wasn’t until the 1960s that the company would create its iconic jelly beans, and those candies wouldn’t feature the Jelly Belly name until 1980. 2. GOELITZ'S MINI BEANS WERE SPECIAL BECAUSE OF THEIR FLAVORED CENTERS. Before Jelly Belly was officially on the scene, the Herman Goelitz Candy Company (which had undergone a name change) released its Mini Jelly Beans in bags of generic flavors. In 1965, the small beans were the first of their kind to have flavored centers, a distinguishing point for Goelitz beans at a time when other jelly beans had flavored shells but bland insides. By 1975, the Goelitz Mini Jelly Beans were available in eight specific flavors, including root beer, cream soda, green apple and grape. 3. THE GOURMET CANDY CONCEPT WAS CREATED BY SOMEONE ELSE. In 1976, David Klein, who was a nut distributor at the time, thought that gourmet jelly beans featuring strong, unique flavors that weren’t commonly available would be worth the extra money to consumers. So Klein created new, exotic flavors and hired the Herman Goelitz Candy Company to create the recipes and a first batch. The overwhelming response to Jelly Belly beans launched Klein’s career—he became the the candy's spokesman and mascot. It won him a lot of publicity—enough that the Goelitz company offered to buy him out. In 1980, Klein sold the Jelly Belly trademark to the candy factory for a whopping $4.8 million, and Klein says he instantly regretted selling off his most-famous creation. The Herman Goelitz Candy Company didn't file to change its name to the Jelly Belly Candy Company until 2001. 4. 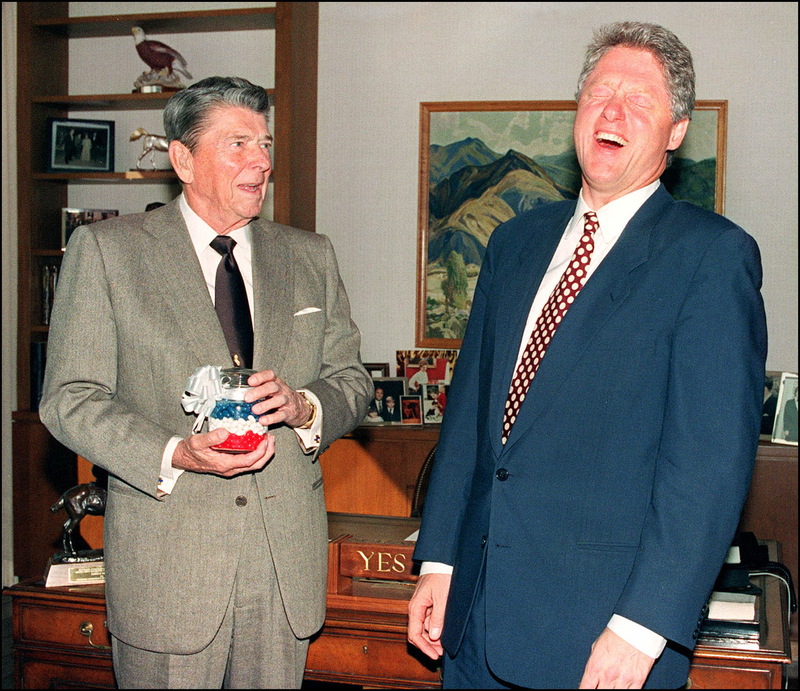 RONALD REAGAN WAS THE COMPANY'S BEST (UNOFFICIAL) SPOKESPERSON. Ronald Reagan was an early advocate of the brand, having been a fan of Goelitz's Mini Jelly Beans since the late '60s, back when he was Governor of California. (He'd used the candy as a smoking cessation tool—and it worked!) For Reagan’s presidential inauguration in 1981, 3.5 tons of Jelly Belly beans were shipped to Washington D.C., including a newly created blueberry flavor to round out the patriotic color scheme with very cherry and coconut. During his presidency, Reagan’s office and the other federal buildings he passed his bags out to consumed an estimated 300,000 jelly beans per month. At one point, specialty jelly bean holders were installed in Air Force One to keep any of the president's precious snacks from spilling during turbulence. 5. 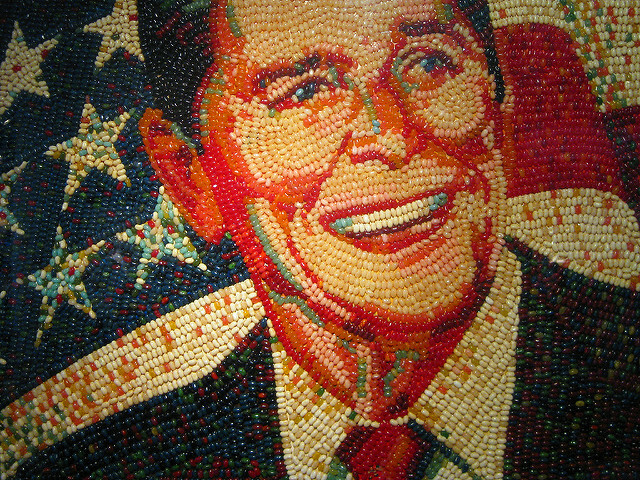 THERE ARE NUMEROUS REAGAN PORTRAITS MADE OUT OF JELLY BELLYS. In an incredibly fitting tribute, the Reagan Library in southern California features one large portrait of the former president in front of an American flag, made out of approximately 10,000 Jelly Bellys. The Jelly Belly factory in Fairfield, California also has a large double portrait featuring both Reagan and First Lady Nancy Reagan. And there are others, including one featuring his famous cowboy hat, another of Reagan in front of a globe, and a separate flag portrait designed from a different angle. 6. JELLY BELLY HAS A STRICT FLAVOR DEVELOPMENT PROCESS. So, what makes a jelly bean gourmet? According to Jelly Belly, it’s the flavoring. While Jelly Belly beans come in 50 original flavors along with specialty beans, new additions are a constant work in progress. The number one rule to new flavors is that they have to be “instantly recognizable”—because what’s worse than not knowing a candy flavor? To make new jelly beans taste like their real-life inspiration, food scientists spend hours researching and taste testing ingredients to narrow in on a specific flavor. Foods that don’t pass the instant test, like Grandma’s Pumpkin Pie, are sent back to the lab for additional tweaking. And sometimes, flops are used as novelty flavors (like barf). 7. JELLY BELLY TRADEMARKED BEAN-SHAPED PIZZA. After taking a tour at Jelly Belly’s California or Wisconsin factories, you can balance out a sugar rush at the Jelly Belly Café. Carbs might replace sugar, but the kidney bean shape remains in the form of pizza and hamburgers. If you’re feeling inspired to replicate jelly bean-shaped buns or crusts, beware: Jelly Belly owns the design trademark for pizza, burger buns. and meat patties. In late 2015, the confectioner filed paperwork to trademark the kidney bean shape for jelly beans, too. 8. EATING GROSS FLAVORS HAS BECOME EXTREMELY MARKETABLE FOR THEM. Unusual flavors, like canned dog food and stinky socks, are surprisingly authentic Jelly Belly flavors. In 2007, the candy manufacturer released the first packages of their BeanBoozled challenge, where classic flavors (like coconut and buttered popcorn) sit alongside their not-so-great look-a-likes (like baby wipes and rotten egg) in the same container. Unsuspecting snackers might be fooled, but mindful eaters are essentially playing a game of taste bud roulette. Is that green speckled bean Juicy Pear, or Booger? For the brave, Jelly Belly is releasing its fourth edition of BeanBoozled this spring. 9. JELLY BELLYS HAVE BEEN TO SPACE. 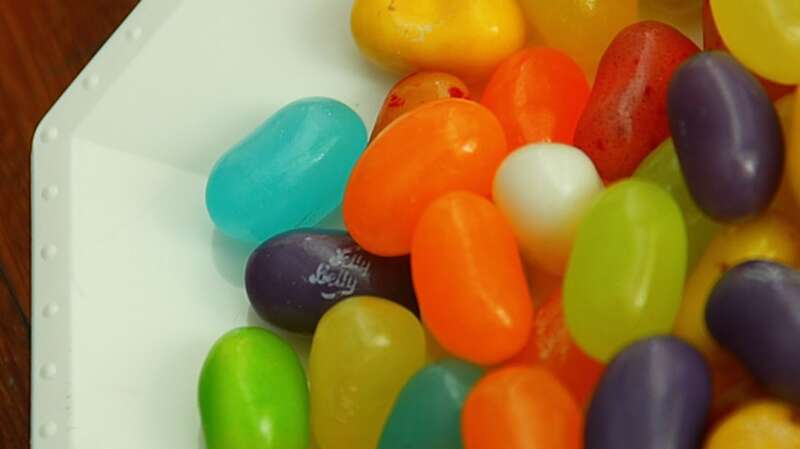 Jelly Belly beans became the first jelly beans in outer space in 1983 when a package was secretly stowed aboard the Challenger on President Reagan’s orders, accompanying first female astronaut Sally Ride into space. Playing with (and eating) jelly beans in space hasn’t stopped since—astronauts on the International Space Station took videos of floating beans in 2007. 10. THE COMPANY'S BEER-FLAVORED BEANS DIDN'T GO OVER AS WELL AS SOME. In 2014, Jelly Belly launched a Draft Beer bean that brewed up tension among parents and candy enthusiasts. The alcohol-free flavor was under development for nearly three years but caused a stir soon after its release because of Jelly Belly’s kid-friendly reputation, despite the company’s assurance that alcohol-inspired flavors were only marketed to adults. Not everyone thought the new flavor was a bad idea—according to Jelly Belly, beer-flavored jelly beans had been a common request for years. And, the beer-flavored beans aren’t the company’s only cocktail flavor; margarita, strawberry daiquiri, and pina colada jelly beans are also available for buzz-free snacking. 11. JELLY BELLY RELEASED A CANDY LINE FOR ATHLETES. It might seem unusual to market sugar and sweets to athletes, but Jelly Belly has its own line of candy for the physically active. Sports Beans are dubbed “Energizing Jelly Beans,” meant for athletes to power up on the go. While some varieties are packed with vitamins and electrolytes, another line called Extreme Sport Beans includes caffeine for a small energy boost. Jelly Belly even sponsors a pro cycling team to represent its sugary sports bites. Perhaps that kind of innovation is what keeps Jelly Belly from becoming stale.